Update on Defining "Core Medical Knowledge"
Want to Know How You Compare to Your Peers? On June 30, AAPA announced that at its most recent meeting of the board of directors, the decision was reached to discontinue its efforts to pursue a new recertifying body. The announcement also signaled AAPA’s commitment to participate more collaboratively in NCCPA’s ongoing efforts to examine the recertification process including piloting alternatives to the current PANRE format. Leaders of NCCPA, AAPA, PAEA and ARC-PA are working now to schedule a meeting for discussion about opportunities for collaboration on this and other important topics. We are continuing efforts to refine the content covered on PANRE to transition from coverage of broad-based general medical knowledge to content that emphasizes “core” medical knowledge. Core medical knowledge is essential and critical to PA practice across all disciplines and practice settings. It is the fundamental body of knowledge and essential skills that PAs rely on for current practice, as they change practice areas throughout their careers or work in more than one clinical discipline. NCCPA began this work last year by convening a group of approximately 60 Certified PAs who embarked on the first step of identifying the “must-know” topics and content that will ultimately be included in the definition of “core” medical knowledge. We have continued that initiative this year by convening three additional meetings, with each meeting including 15-25 PAs representing diverse practice settings and disciplines. These volunteers are individuals who answered our call for participants in 2015, as we began our exploration of PANRE. They have not been involved in the development of any of our exam programs, and they bring a fresh perspective to NCCPA. Later this summer we will invite all Certified PAs to participate in a survey developed from the work done over the past 18 months. This will give all an opportunity to weigh in on what content should be covered on PANRE as it transitions to core medical knowledge. Please watch your email for future messages from NCCPA about this survey and participate to ensure your perspective is heard! We know that some PAs are interested in accessing PI-CME activities designed for physicians and often available through their employers. NCCPA explored these learning opportunities and engaged in vital conversations with leaders from the American Board of Medical Specialties (ABMS) and others. As a result, recently NCCPA’s Board of Directors approved the expansion of the definition of Performance Improvement CME (PI-CME) activities, broadening opportunities for PAs to access PI-CME activities that may be available at the practice level, while also realizing the extra weighting benefit that NCCPA applies to these high-value CME activities. American Board of Medical Specialties (ABMS) Multispecialty Portfolio Program (“Portfolio Program”) activities. Search for AAPA-approved Category 1 PI-CME activities, Part 4 MOC activities, and Component 4 OCC activities by specialty or keyword at https://www.nccpa.net/finding-sa-and-pi-cme. Portfolio Program activities are available directly through participating employers. For a list of hospitals and institutions that are participating in the Portfolio Program, visit http://mocportfolioprogram.org/about-us/portfolio-program-sponsors/. PAs whose employers are not on that list but that are interested in participating should encourage administrators to learn more at http://mocportfolioprogram.org/become-a-sponsor/. Thanks to a collaborative agreement between NCCPA and ABMS, Certified PAs can now obtain free PI-CME credit for certification maintenance for participating in patient safety and performance improvement activities to improve the quality of patient care in their employing institutions. This new collaboration is a first for the Portfolio Program, which was created to offer Board Certified physicians the opportunity to earn Maintenance of Certification Improvement in Medical Practice (Part 4) credit for their involvement in institutional quality improvement (QI) and PI activities. NCCPA will award PI-CME credit to PAs for Portfolio Program activities. This is especially significant since NCCPA weights PI-CME activities more heavily than traditional Category 1 activities. The first 20 PI-CME credits earned during a PA’s two-year CME cycle will be doubled by NCCPA. Portfolio Program activities are equivalent to 30 CME credits before the weighting. “We have pursued this partnership with the ABMS Portfolio Program because we truly believe in the value of practice-based, improvement-focused activities as a way to support the continuous professional development of PAs while also making a direct, positive impact on patient care and outcomes,” said Dawn Morton-Rias, EdD, PA-C, NCCPA president/CEO. ABMS reports that the Portfolio Program has helped engage physicians in QI and PI initiatives at hospitals and health systems across the country, with many showing improvement in care outcomes. Since its inception, more than 2,000 improvement efforts have been completed by Portfolio Program participants. For more on how the Portfolio Program works, visit https://www.nccpa.net/abms-portfolio-program. Thank you to those PAs who have already updated your PA Professional Profile! You now have access to reports that compare your profile responses to those of all certified PAs, to PAs in your state, to PAs in your specialty, and to PAs who are in your state and specialty. These reports provide information on salary, years in practice, hours practiced per week, and more. You can see in the image below several different criteria displayed and then how you can choose a specific criteria area and expand it to gain more detail. If you haven’t updated your PA Professional Profile in your online record at www.nccpa.net, we encourage you to do so now, so you, too, can have access to these same reports. To update your profile, click on the “My Professional Profile” tab in the left-hand menu bar of your online record. This information provides the most accurate, detailed information on the PA profession – where and how Certified PAs are practicing today. Celebrate 50 Years of PA History While Supporting the PAHx Too! Remember the PA Profession’s golden anniversary with a commemorative 50th Anniversary Poster or 50th Anniversary Lapel Pin. The items can be ordered through the PAHx website for a nominal, tax-deductible donation. 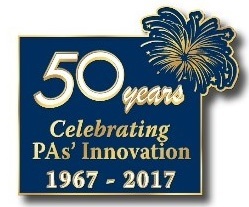 Show your PA pride with this special edition lapel pin commemorating the profession’s 50th anniversary. Perfect to wear on your white coat! A colorful 24” x 36” special edition poster ready to be framed and featured in your clinic, office, classroom, medical library, etc. This special edition comic book features the adventures of Chipper Wallet, a main character from the syndicated cartoon strip Gasoline Alley. Chipper’s story historically parallels that of other former military corpsmen who became PAs, and the comic strip drew national attention to the PA concept during the early ‘70s. The special edition comic book follows Chipper over the span of 50 years, from his years of service as a hospital corpsman in the US Navy (1967-1970), his decision to become a physician assistant (1970-1973) and his return to the comic strip as a pioneering physician assistant (2016-2017). 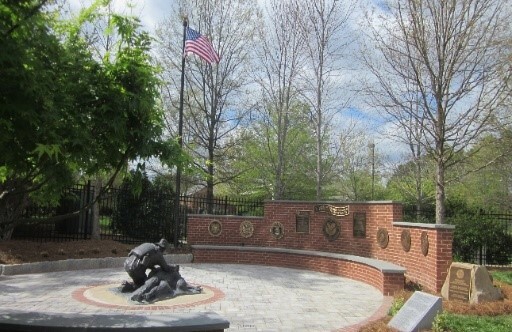 The newly renovated Veterans Memorial Garden located at the Stead Center, is the only garden that honors strictly the contributions made by military and uniformed services PAs. Engraved brick pavers are still available and can be purchased online here. The engraved paver will include the appropriate uniformed service logo and 3 lines for name, branch and years of service. For more information on any of our special commemorative gifts, please visit the PAHx website, or email us at: contactus@pahx.org. Also, check out the latest edition of the Society’s newsletter, Historical Happenings. Stay up-to-date on “all things PA history” by connecting with us on social media. Please be sure to “like” PA History Society on Facebook to receive weekly updates and follow the Society on Twitter, LinkedIn and our Blog. Recipient of the 2016 Kathy J. Pedersen Grant to Promote Equitable Care, Cynthia Bunde, MPAS, PA-C, from the Pocatello Free Clinic, improved outcomes among uninsured patients with mental health diagnoses. Project participants received text messages three to four times a week that encouraged treatment adherence, provided mental health resources, and fostered communication. Participants also completed questionnaires regarding mood rating, medication adherence, and perceived ability to manage their condition pre- and post- the 12-week intervention. No-show rate was also evaluated. Participants showed statistically significant improvement in three of the four measures. Read the full grant report here. Thanks to all who applied for the 2017 grant cycle, which closed in June. Stay tuned for the announcement of this year’s grantee later this summer. 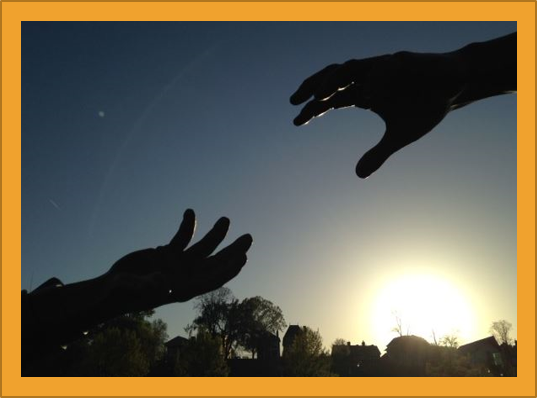 Interested in the Foundation’s grant programs available now? Learn more online. The nccPA Health Foundation released the last two videos in its four-part series highlighting small steps PAs can take to impact the oral health of every patient. Watch the Collaborate (3:35) and Educate (3:14) videos. The “Collaborate” video illuminates the shortcomings of fragmented care and the advantages of patient-centered, team-based care; it also offers six best practices PAs can implement to impact health. The “Educate” video calls on PAs to activate patients for self-care, which fosters better outcomes related to preventable oral disease, reduces disparities, and contains individual and system costs. Designed with clinicians in mind, the videos build on the Foundation’s past oral health videos available in its online video library. Ready to integrate oral health in your practice or through outreach? Check out the Foundation’s oral health grants, which provide funding for PA and student efforts. This four-part video series is part of the PA Oral Health Leadership Initiative supported by the NIIOH and its funders. Read the Physicians Practice blog on Treating America's Veterans in Your Practice by NCCPA Immediate Past Board Chair Denni Woodmansee, MS, PA-C.
View a joint press release by NCCPA and the nccPA Health Foundation on Mental Health on the Forefront of Issues for Certified PAs. Meet another PA who is breaking the mold: Lyle Larson, PA-C, the first PA to co-author a surgical textbook directed at physicians in the cardiology subspecialty of electrophysiology.